Chico Hamilton that is. Intelligent football magazine When Saturday Comes prints in each issue a photo or selection of photos about football past. This month it was the turn of old villa club photographer Terry Wier. 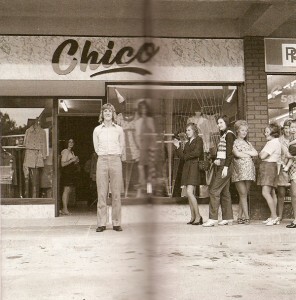 One of his shots is this, of a proud Chico outside his obligatory boutique (excuse the line, this one is scanned from across the fold). Where was this fabulous shop? Something tells me it’s in a High Street somewhere rather than being slap in the centre of town — but do you know where? A load of Terry’s photos were collected into a book, called The Weir and the Wonderful (it’s still available, but not cheap). it says the shop was in wylde green in that times article. I should read more thoroughly ;) Wylde Green has that dreadful sixties shop parade set-up? Blimey.